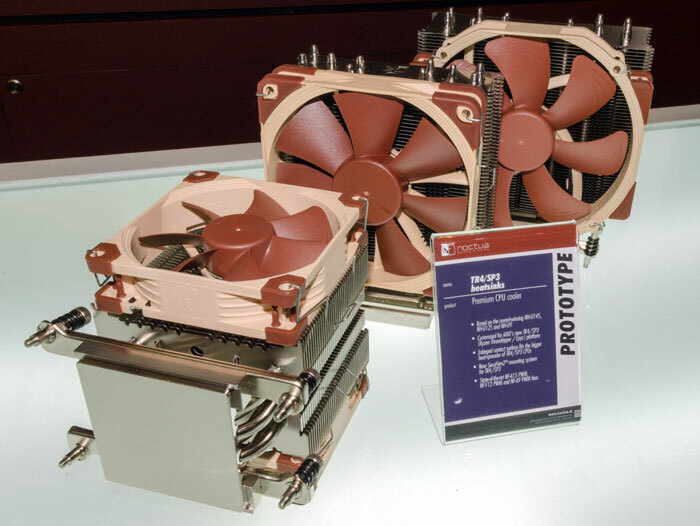 Austrian PC cooling specialist Noctua was displaying its wares at Computex but HEXUS didn't get time to visit and video its exhibits. Thankfully, the company today emailed a recap and summary of all its products and prototypes to us. The news is backed up by a new Noctua blog post here. 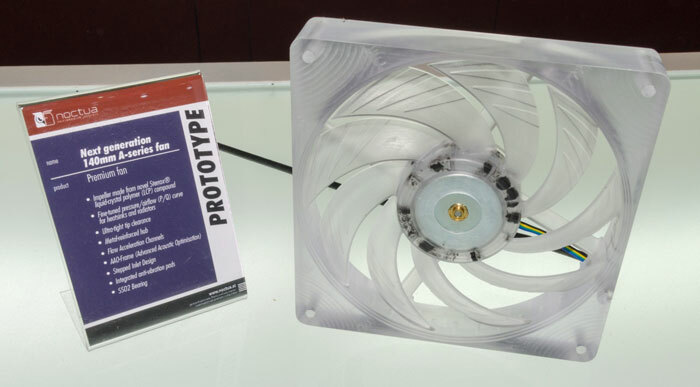 Among the products on show were prototype 120mm A-series fans (under demonstration, as pictured above) and, predictably, products compatible with the latest AMD X399 and Intel X299 platforms. On the topic of Skylake-X and Kaby Lake-X: all current Noctua coolers are said to be compatible already, as the LGA2066 heatsink mounting mechanism is shared with the previous LGA2011-0 and LGA2011-3 sockets. 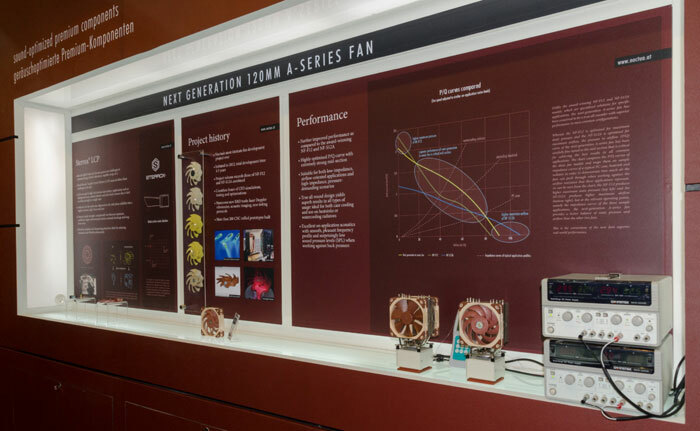 The highlight of Noctua's exhibition stand showcase was the upcoming A-Series 120x25mm high performance fan. 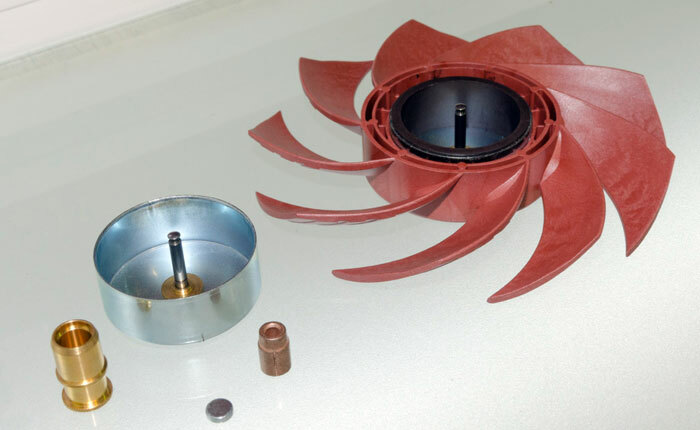 In Noctuas own tests at Computex it was shown that a single prorotype fan could match or even beat "two of the renowned NF-F12 fans on an NH-U12S heatsink at a heatload of 190W". In some background info supplied to us, Noctua says that the new fan features "a record tight 0.5mm tip clearance," and will be manufactured from Sterrox liquid-crystal polymer (LCP) compound. Another bonus of the new 120mm fan is that it was shown to be quieter too. This fan is expected to hit the market in H2 2017. Noctua also had prototype A-series fans in the following sizes; 140x25, 140x15, 80x15, 70x15 and 50x10mm. The largest model would be a good choice for high-end CPU coolers or liquid cooling setups reckons Noctua. With plenty of tuning and refinement still needed to these particular fans they aren't likely to hit the market until H2 2018. However a 60x15mm model has moved from prototype to pre-production stage and should be available in Q1/Q2 2018. 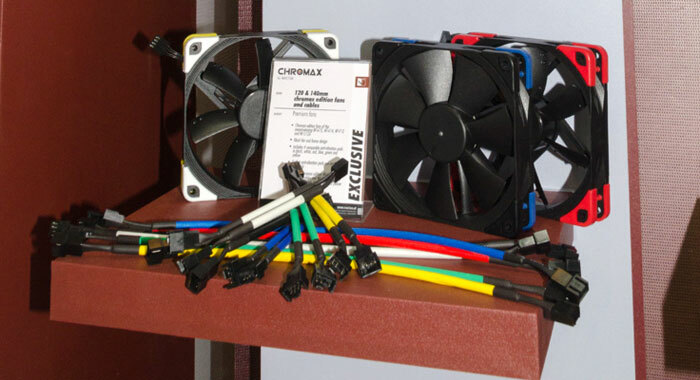 Colourful components fans are rather popular for PC system customisation and Noctua gave notice that it is preparing Chromax line versions of its award-winning NF-A15, NF-A14, NF-F12 and NF-S12A fans, and coloured fan cables as well as customisation accessories for heatsinks. Coloured anti-vibration pads (black, white, red, blue, yellow and green) will enhance the visual appeal further. Expect these to arrive in Sept/October. Chromax slide-on heatsink covers for the NH-U12S, NH-D15 and NH-D15S are now finalised and will ship later in 2017. For AMD Ryzen Threadripper and EPYC platforms Noctua showed off 140, 120 and 92mm size CPU coolers that feature an enlarged contact surface "to match the new CPUs' gargantuan heatspreaders". Noctua will make these coolers available on, or shortly after, the release date of the new AMD platforms. Quite a intresting write up over on PCgamer about these fans if anyone is intrested, apprantly plastic grows to much to use in these fans over time hence the fact they are made of liquid polymer from the same family as Kevlar, apparently it costs 4x as much to produce though so gonna be expensive. best fan company in teh world bar none ! glass filled nylon would probally cure this problem and is is every day use (recycled carpets)….. once notcta has reseached this maybe call RGE Engineering in england as they are wizards in this ingreedient. Designed in Austria built in China.. yeah quality matters!! lmao!